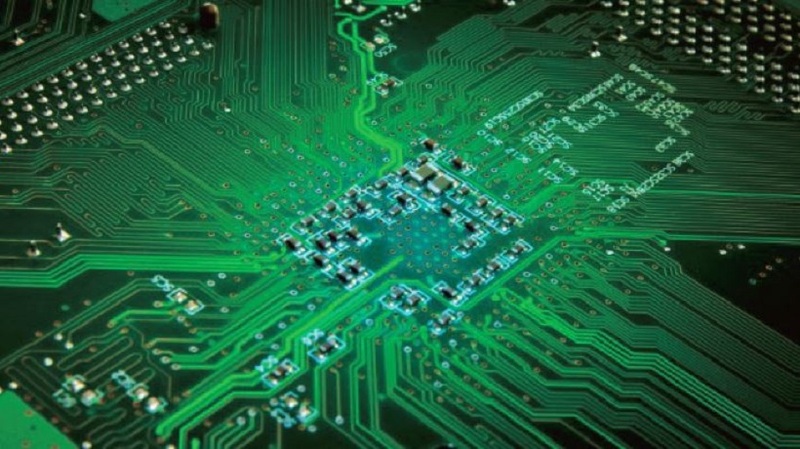 In response to increasing market demands for lighter and smaller products, printed circuit board (PCB) manufacturers are reducing the dimensions, thickness, and weight of their PCBs. However, this change has led to fractured tin solder joints becoming a common problem. Furthermore, during manufacturing, PCBs are subjected to various equipment and testing processes, which place the circuit boards under varying degrees of stress. The electronics industry has also begun to replace traditional tin/lead solder with lead-free soldering materials, which are relatively weaker. The result is that under the same levels of mechanical stress and tensile strength,solder joint failures have become a serious problem. Consequently,PCB manufacturers have begun to introduce various stress measurement solutions to avoid fractured tin solder joints and increase their overall yield. In order to detect defects caused by stress at an early stage, PCB manufacturers are planning to introduce stress measurement systems into their production processes to verify whether the maximum mechanical stress is within a safe limit. The most common form of stress measurement involves using a data acquisition module to measure changes in the electrical resistance of strain gauges. To measure strain during testing, the system must provide an excitation voltage to measure the resistance change in the stress gauge’s electrical conductor. However, because the change in electrical resistance caused by external forces is extremely small, a Wheatstone bridge must be built into the circuit’s high-precision data capture module to detect the resistance change of a stress gauge. A minimum resolution of 24 bits is required to measure such a small change. In addition, to further increase the accuracy of strain analysis results, synchronous sampling between each channel of the data capture module must be implemented to prevent deviation caused by sampling delays between various channels. The stress measurement solution provided by Advantech comprised its MIC-7500 compact modular computer, PCIE-1813 4-channel,26-bit simultaneous strain measurement card, and a signal processing card to provide isolated DI/O and signal filtering features. Generally, 4 to 12 sets of strain gauges are used to measures train on a circuit board. For this type of measurement system,strain gauges attached to the PCB are connected to the signal processing card, which filters out the noise. The PCIE-1813 strain measurement card’s parameters are then configured according to the specifications of the strain gauges in order to collect signals sent by the strain gauges based on the specified sampling frequency,magnification rate, and excitation voltage.The most important product in the solution is the PCIE-1813 card,which is capable of providing extremely high resolution measurements. The card’s 26-bit resolution provides the ability to detect and measure the slightest change in the strain gauge. The built-in supply of excitation voltage allows the card to be directly connected to the strain gauge. No additional modules are needed to provide the excitation voltage. The PCIE-1813 card also offers excellent magnification rates and the input range is able to reach ±31.25 mV/V. 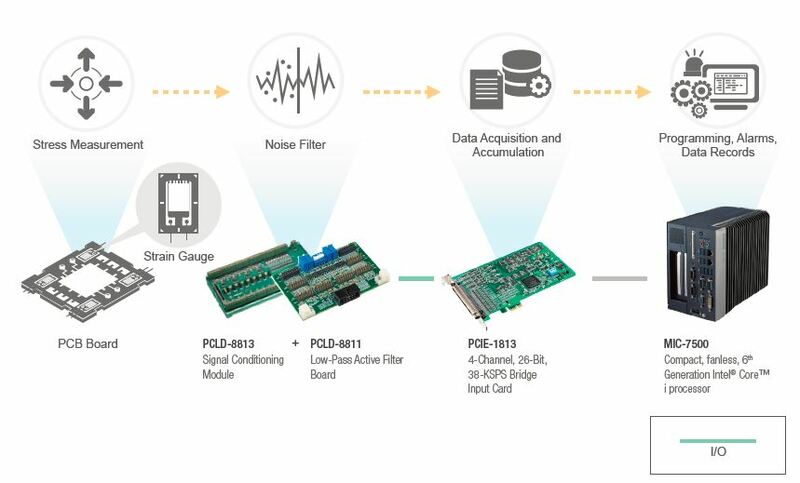 In addition to its four sets of analog-to-digital converters (ADC), which can be used to collect signals from four channels simultaneously, the PCIE-1813 card also provides a trigger function for implementing synchronized multichannel data collection to meet the synchronized precision sampling requirements. PCB stress measurement systems depend heavily on data collection products that are capable of providing high-precision stress measurements. Advantech’s high-precision PCIE-1813 card offers several advantages, including high resolution, an outstanding price/performance ratio, as well as numerous signal processing features. In addition to satisfying the measurement system requirements,this solution allows customers to select a modular industrial computer from Advantech’s MIC-7500 series based on the number of card slots available as well as their strain test requirements and rapidly build various stress measurement systems.